Don't Believe What You Read In The Media. “All they want is your money,” said paralegal Betsy Combier, who helps defend teachers. “It doesn’t matter what happened to the kid — it’s kind of frightening.”. "What I told Ms. Edelman was that when an educator is charged with misconduct or incompetency, and sign up for a NYSUT attorney, in many cases the NYSUT Attorney tries very hard (sometimes, in my opinion, abusively) to get the educator to resign, retire, leave town, or settle. Anything but go to a hearing. I believe the NYSUT Attorneys know how much of a due process disaster the hearings are, from the viewpoint of defending an educator's rights. After watching the attorneys work at 3020-a for almost 8 years, 2003-2011, I thought there was a better way to defend, and started as a paralegal advocate in defense of Respondents brought to 3020-a in 2011. No one who is innocent of charges should be forced into a settlement of any kind. You can win a 3020-a." Knowing Betsy like I do, she would never had said what the New York Post quoted her as saying. Both Betsy and I see the settlements as DOE extortion when they cannot prove their case for termination and offers the terrified teacher a way out. Please read Betsy Combier's blog for her story. Remember, when you read stories that come from these rags, the Daily News, Post, and Times, don't believe what your reading, its not about the truth. For educators who want to know how to defend themselves against abusive administrators, there will be a "Don't Tread On Educators" (DOTE) meeting on Wednesday, October 1, at the Elmhurst Diner located at Grand Avenue and Queens Blvd, starting at 5:30pm. Be there if you think you are being targeted. Plenty of parking in their parking lot and the M or R train stops there. DOE's Education On The Cheap Policy - Its Not About The Students, Its About The Budget. One of the issues the news media fails or doesn't want to discuss is how the NYC public schools have been shortchanged of needed resources and the questionable funding priorities the DOE has taken that finds most every school struggling to provide the proper educational services for their students. Despite a 26 billion dollar budget, the DOE, has reduced the average school budget by 14% since the 2007-08 school year despite the fact that the DOE's own budget had increased 39% since that time. Furthermore, and shockingly, the disappointing Chancellor, Carmen Farina, froze school budgets at least year's level, adding to the financial pain at the schools. Where did the increased funding go? Obviously, not to the schools and the students. Let's look at the various items that have been part of the DOE's "education on the cheap " policy. School Budgets: Every school I was in last year claimed they were short of resources. In many schools, teachers had to buy their own classroom supplies, even copy paper! Photocopy machines and smartboards lay broken for weeks at a time. In the schools where there is an active and engaged PTA, the fundraising by the group pays for things such as class trips, and technology upgrades, taken for granted in the suburbs. When the disappointing Chancellor shocked everyone by freezing the already inadequate and tight school budgets, it just adds to the financial squeeze that the schools are in. 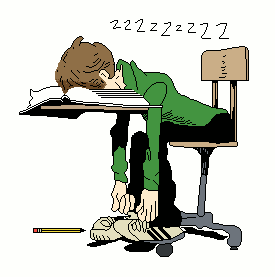 Librarians: Many schools either don't have a librarian or have a part timer in the school library. Once, every school was required to have a full time librarian. In many of the Bloomberg small high schools, there is no librarian and the libraries that once was a hallmark of the big high school is usually locked and unusable to the students. The problem is so acute that even the Commissioner of NYSED has required that the DOE hire librarians. Guidance Counselors: The lack of enough Guidance Counselors in schools has become a real issue for the majority of schools. Guidance Counselor caseloads of 400 or more students are commonplace. Students are lucky if they see their Guidance Counselor more than once a semester. How many students fall through the cracks when these students are not able to develop that close personal relationship with a trusted adult trained to help them because of the infrequent contact between the two? Worse, the DOE unwisely decided to assign ATR Guidance Counselors to a weekly rotation, making them useless to the school's Guidance Department. Finally, some principals brought in poorly trained and low paid community relation specialists that simply provide a bandage to an infection. The City Council has told the DOE to address this situation through their Education Committee. 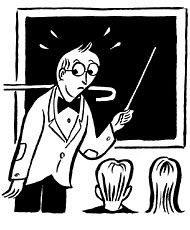 Sixth Periods: It seems that most every high school I was in had a significant number of teachers teaching a "sixth period". While some of them were actual "shortage areas", most of them were teaching a "sixth period" as a way for the school to hire less teachers. Many of these teachers were paid "per session", if it wasn't a shortage area or was outside their school schedule. In quite a few cases, Earth Science programs were being taught by non-certified Earth Science teachers and schools went from a 5-1 to 4-1 Science program as a way to reduce the amount of Science teachers, even when Regents scores and passing rates plummeted as a result of the change. disappointing Chancellor failed to do so. Class sizes in New York City are the highest in the State and will remain unacceptably high for the foreseeable future. Oversized classes are once again in the thousands with an estimated 3,500 in violation of the contract, according to the UFT website. Principal Quality: approximately 20% of all New York City Public School principals came from the infamous "Leadership Academy". Many of these principals have limited classroom experience, some never earned tenure! Their primary concern is their budget and to intimidate staff. They have little idea how the classroom environment works nor do they care. To them its about the bottom line, test scores, keeping their "Children First Network" happy, and using funds as they see fit. Its not about the students, its about the budget. Bloated Bureaucracy: It goes without saying that too much money is paid out to high priced consultants, accountability experts and lawyers. Furthermore, the schools are forced to choose and fund the useless and money sucking "Children First Networks" that provides little real support to the schools. Finally, the lack of transparency at the DOE makes the flow of funds hard to trace and that's why we end up with stories like this as the DOE rarely holds themselves accountable. Fair Student Funding: Probably the biggest reason for the failure of New York City schools to show real and relevant academic improvements since it encourages Principals to hire the "cheapest" and not the "best" teachers" for their students. Case in point, the City hired 6,000 new teachers this school year, while most of the 2,000+ ATRs couldn't even get interviews, especially, the ATRs who have ten or more years in the system. If the City was really serious in improving student academic achievement, they need to centrally and fully fund the New York City Schools and under the new Mayor and disappointing Chancellor, its not happening, at least for another year. Why The Richard Parlini Case Has Little To Do With Teacher Tenure. In a New York Post opinion piece, some of the parents that were outraged when they found out that teacher Richard Parlini was reinstated to his teaching position at P.S. 101Q in Forest Hills, despite accusations of corporal punishment, verbal abuse, and bullying, stated why they joined the lawsuit against teacher tenure. According to the Daily News, Mr. Parlini made a deal with the DOE and paid a $2,500 fine and took a six hour course to make the charges go away. He was then allowed to return to the school and was scheduled to teach the first grade until some of the parents complained to the press. Due to the negative publicity, Mr. Parlini was hastily assigned by the DOE to administrative duties at the school until another position is found for him at a different school. Some of these parents then joined the teacher tenure lawsuit, citing the Richard Parlini case as a reason why teacher tenure laws needs to be changed. However, if one looks at the Richard Parlini case, it has little to do with teacher tenure but everything to do with the DOE deciding not to go forward with 3020-a charges and his Principal wanting the teacher back at the school. First, if the DOE's Office of Legal Services really had a solid case against Mr. Parlini, they would have pursued 3020-a termination charges against him as they have done to too many others and let an independent arbitrator determine the "award" (penalty). Second, the DOE may have realized that the accusations lacked credibility when they did the preliminary investigation. Finally, its very obvious that the Principal of the school wanted him back, otherwise he would have been immediately assigned to the ATR pool since he agreed to a stipulation and paid a fine. Is Mr. Parlini guilty of what he was accused of? Who knows? However, if the DOE believed they had real evidence, Mr. Parlini would have gone through a 3020-a termination hearing as many other teachers have done. The fact that the DOE reached a settlement with Mr. Parlini had nothing to do with the teacher tenure issue but has everything to do with the credibility of the accusers and the Principal wanting him back into her school's classroom. With or without tenure protections, the result would probably end up the same way since it was up to the DOE to initiate charges and decided not to. Place the blame on where it really belongs, the DOE for sending Mr. Parlini back to his school and not the teacher tenure issue. 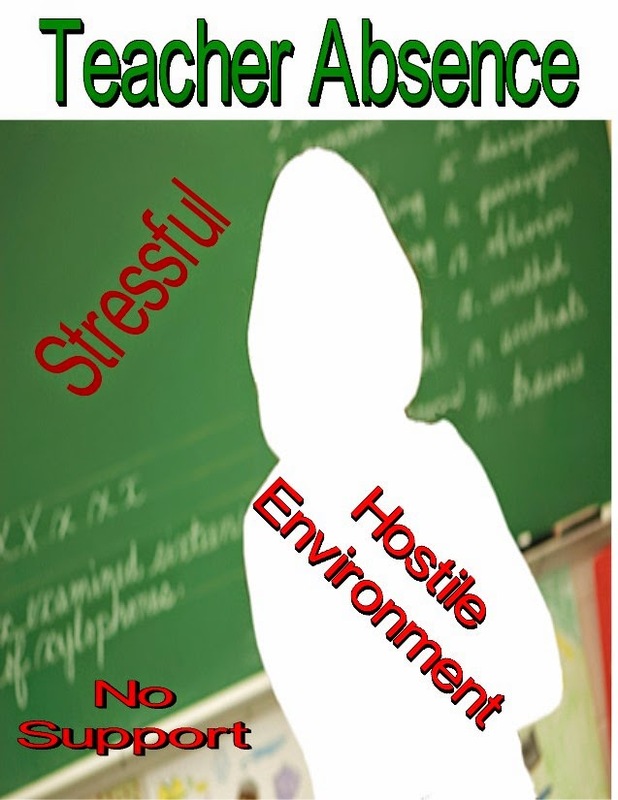 Teacher Absences Increased Significantly Due To City And State Polices That Adds Stress To The Already Hostile Classroom Environment. It was no surprise that the DOE reported a !2.3% increase of teachers that took excessive absences, meaning 11 or more days off in the 2013-14 school year over the year before. That comes out to be an astounding 13.2% of the entire teaching force of 74,000 or almost 10,000 teachers who called in sick that used over the ten sick days allocated for the school year. The New York Post article can be found. Here. Interestingly, the DOE claims this 12.3% increase in excessive teacher absences isn't significant, really? In addition, our union leadership claimed it was that maternity leave accounted for the increase. However, a union member blamed it on the Common Core. 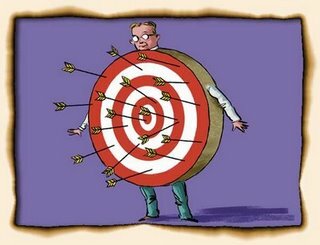 The real reason that there was a 12.3% increase in excessive teacher absences can be associated with the State's Teacher Evaluation System, the Danielson framework, and the failure of many school administrators to properly support their teachers when it comes to misbehaving and disrespectful student behaviors. To me, the increased excessive absences is proof positive that the classroom environment has become even more hostile and stressful, when the State and City policies and paperwork are rammed down the teacher's throat. Waiting for the new Mayor and his disappointing Chancellor to make the classroom environment less stressful and more peaceful is simply a pipe dream that our disconnected union leadership tries to sell. However, the reality is very different and the significant upsurge of excessive teacher absences demonstrates this reality.as many of these teachers are fleeing the hostile classroom for as many days as possible to keep their sanity. I also believe if one broke down the statistics and look at the individual schools, I bet one would find that the low academically achieving schools and those schools with terrible administrations suffer the greatest teacher absences and yearly turnover. Finally, when one combines the increased teacher absences with the DOE's recruitment over retention policy, the result is a failure by the DOE to implement workable strategies to improve student academic achievement and to narrow the unacceptably wide income/racial achievement gap in the New York City Schools. Why A Physically Fit Student Is Important For Academic Achievement. One of the things I noticed that in many of the academically poorly preforming high schools how out of shape many of the high school students looked. When I covered a physical education class as a second teacher I would observe that half of the students wouldn't bother to exercise or participate in the activities that the physical education teacher planned. In fact, a substantial number of these students didn't even bother to change into their gym clothes but sat on the bleachers and talked to each other. Worse, is that many of the Bloomberg small high schools have inadequate or no gym space and the State requirements are routinely violated and ignored by the DOE, with no consequences from the State. I blame this on the school administration who allow students not to participate or even dress for physical education and then pressures the teacher to pass them anyway. Is it any wonder many of these students look the way they do? By contrast, in academically performing schools, every student is required to participate in gym. For the students at these schools not only do they dress for gym and are required to participate in the activities but goals are set for each student to meet. By the time the school year is over, many of the students are physically fit which translates into a better body image, alertness in the classroom, and better grades. If schools are really serious in improving academically then they must require all students to meet the physical education standards that they have ignored for years by the DOE. Otherwise, look for continued academic failure as these out of shape students fall asleep in class and stay unfocused while doing poorly on tests.If it really is "students first" then start with improving their physical fitness. 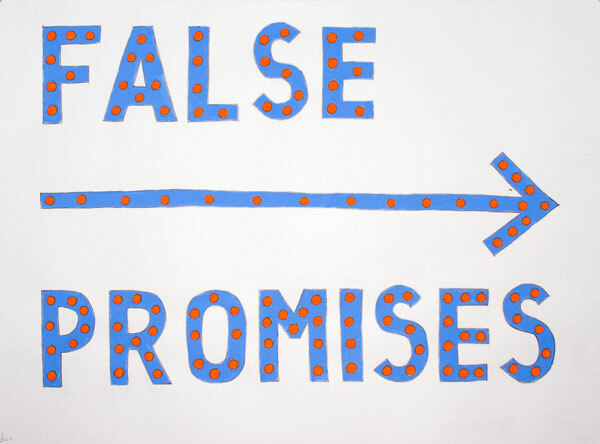 Don't Expect NYC Schools To Improve Academically Under The DOE's Present Policy. With much fanfare and little scrutiny, Mayor Bill de Blasio and Chancellor Carmen Farina praised the miniscule increases the City students achieved on the 2013 State tests and have proclaimed that 100% of the NYC school children will be passing the State tests. However, when one takes into account the lower cut scores and the large "opt out" cohort, any real academic progress is simply "smoke and mirrors". The politicians can crow all they want about imaginary academic gains but the truth is that these supposed gains are illusionary. Moreover, the unacceptably wide racial/income academic achievement gap has not improved and this is shown by the analysis done for the 4th grade citywide. According to the report, the top schools are predominately made up of students that come from the surrounding diverse middle class neighborhoods or are screened, while the worst preforming schools are in neighborhoods of deep poverty and nearly 100% Black and Hispanic. The question is how can we improve the academic ability of the New York City school students? There are ways. However, the new Mayor and his disappointing Chancellor has done little to take strides in that direction. For example, despite the Mayor's pledge to reduce class size, the opposite happened, class sizes have actually increased once again for the elementary and middle schools. Numerous studies have shown that class size has a significant effect on classroom learning and the City has the largest class sizes in New York State. Until class size is reduced significantly, don't expect any academic improvement. 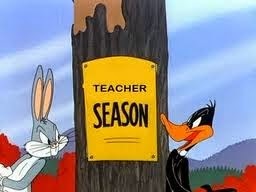 Another issue, is the lack of "quality teachers" in the classroom. The new administration has continued the destructive "fair student funding" policy that encourages principals to hire the "cheapest" and not the "best teachers" for their schools. Since 50% of these teachers will leave the profession in five years and over 80% from the school they started at, few will ever become a "quality teacher" for the school that hired them. 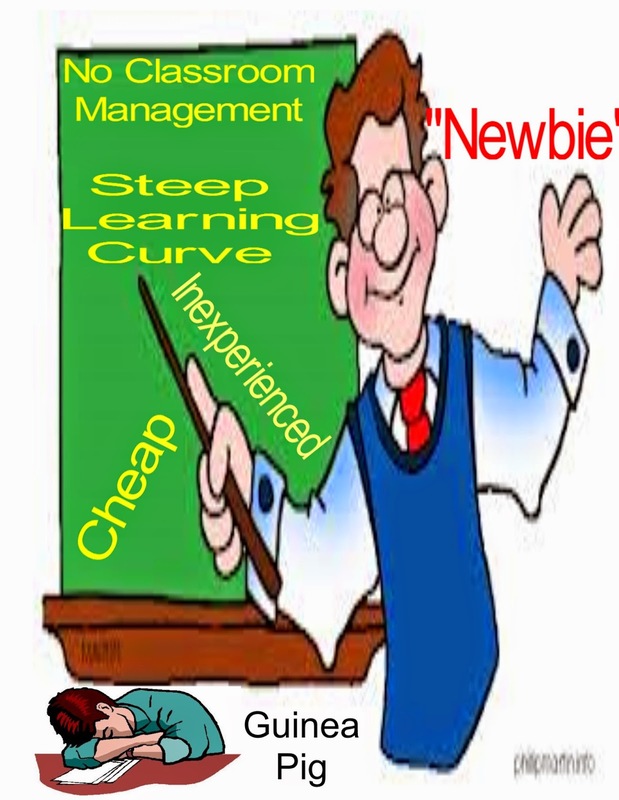 Moreover, the steep learning curve "newbie teachers" experience makes their students guinea pigs until the teacher has demonstrated good pedagogy skills and gets tenure three years later, if their the lucky 60%. A seven year study showed how difficult it was for struggling schools to attract effective teachers. Even the offer of $20,000 extra for a two year commitment met with few takers. How does the DOE expect to attract teachers to struggling schools for a measly $5,000? The answer is they don't. Combined with a hostile and stressful classroom environment, is it any wonder that retention is a problem? High teacher turnover and poor academic achievement in these struggling schools go hand in hand. 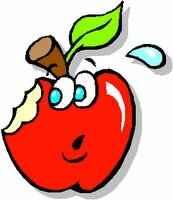 Shockingly, Chancellor Carmen Farina froze already tight school budgets at 2013 levels and that is 14% less than in the 2007-08 school year. 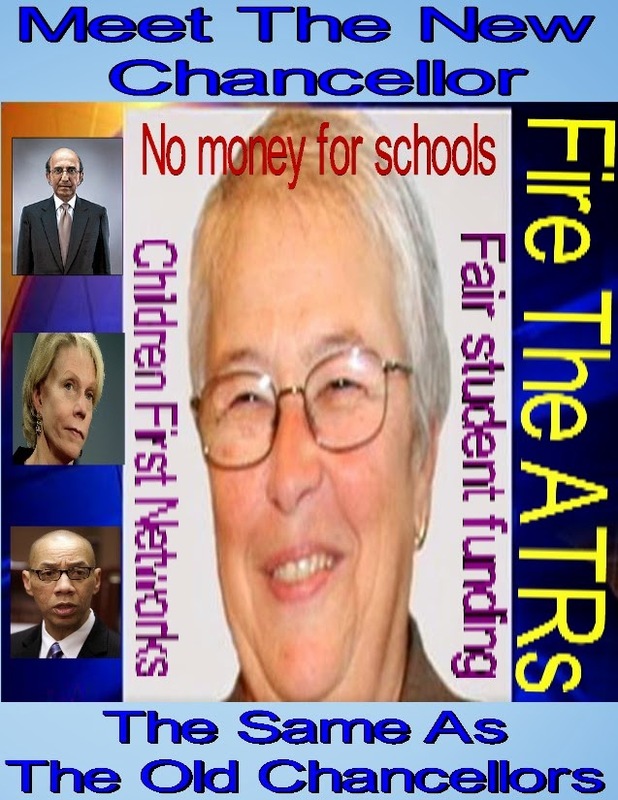 She unwisely kept the money sucking and useless "Children First Networks" and worst of all, the Chancellor has made the demonetization of the 2,000+ ATRs part of the new contract, meaning that the DOE will waste money and talent by having high priced "babysitters" rotating weekly from school to school. Finally, under the new Chancellor, the failed policies of the Bloomberg Administration are still evident and many of his architects are still in control of Tweed. Rather than "clean house" she has kept many of them in place and the classroom environment is still as hostile as ever with loads of paperwork, Leadership Academy Principals" and inadequate school resources a norm. What needs to change to make real academic progress? Lower class sizes, the elimination of "fair student funding" with all staff salaries coming out of DOE Central like it used to be. Downsizing and folding the Children First Networks into the Superintendent's Office, with the savings going back to the schools for resources and the placing of ATRs back into the classroom with the 160 million dollar annual savings being used for hiring of more teachers which will lower the average class sizes, especially in deep poverty neighborhood schools. Mark my words, without the usual academic tricks any real academic progress will be illusionary and will; not result in the narrowing of the racial/income academic achievement gap. 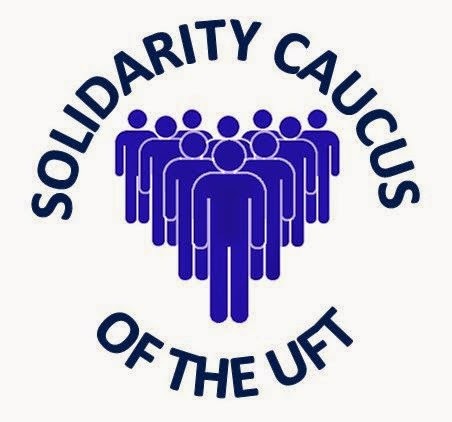 Join The New UFT Caucus - Solidarity, Where Mainstream Teachers Have A Real Voice. There is a new UFT Caucus that has formed that will be focused on "teacher justice", not social justice, and will act as a real trade union, representing school staff in the New York City public schools. This new and dynamic caucus is call "Solidarity" and will represent the mainstream educators, the disenfranchised ATRs, and those without tenure. This caucus will be a real trade union caucus and will not dilute the message by having a "social justice" plank or spend member money on causes that the union leadership decides, without member input. The "Solidarity" caucus will represent teachers and school staff. and not muddle their message with tangential issues that have nothing to do with education. If you are a teacher or school staff employee and want what's best for your school then its time to become a member of "Solidarity" who will advocate for the educator and not hugging the Chancellor or supporting marches that demonize fellow union members. Join the "Solidarity" caucus and belong to a real union that represents school staff and help improve the hostile classroom environment that our present no-accountable union leadership allowed to happen on their watch. Its time that the rank and file have a real union that listens to their concerns and that is "Solidarity". Here is the link to join. Its Our Own Fault For The Lack Of Real Democracy And Transparency In The UFT. Over the years, many teachers have bemoaned the fact that our union leadership has ignored the wishes of its members. The complaint is that the union lacks real democracy and transparency in its operation. While I agree 100% with these teachers, the blame must be placed where it belongs and that is on ourselves. If we look how our union operates, we see that our union is dominated by one caucus, "Unity" which requires total subservience to the leadership, where any dissent results in expulsion from the caucus and the perks that go with it. No other caucus requires a "loyalty oath" as a condition of employment in the UFT. Decision-making is done by a small inner circle of Unity loyalists, dominated by President Michael Mulgrew, and rather than reach out to the rank and file for their input, they impose their own political philosophy and claim that is the union's position. Even the District Representatives are appointed by the union leadership when before Randi Wiengarten came to power the District Representative was voted on by the Democratically elected Chapter Leaders of the Borough or District, The latest two examples of the union unaccountable leadership riding rough shot over the members were the recently negotiated inadequate contract that threw the ATRs under the bus, deferred raises as far away as October 2020, and eliminated retroactive raises for ex members who resigned, were terminated, died, or became an Administrator, just to make the new Mayor look good. Yeah, I know that 77% voted for the contract but it was the scare tactics used by the leadership such as "if we don't approve the contract, we go to the back of the line and the City won't have the money to pay us." that scared many members in voting for it. Then there was the Al Sharpton led anti-police march that the UFT co-sponsor, using member dues money to fund. 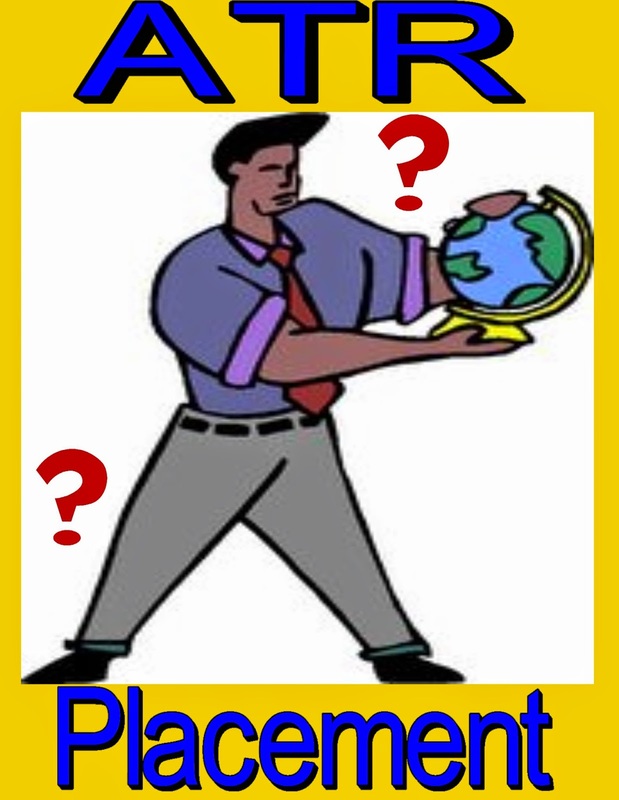 75% OF UFT MEMBERS DID NOT PARTICIPATE — WHY? The majority of UFT members did not bother to participate in these elections. Out of 173,407 ballots mailed, only 43,138 were returned. When 75% of the membership doesn’t think voting is worth their time, that’s a serious problem. We can’t read the minds of those roughly 130,000 non-voting members, but we can imagine that frustration, demoralization, and basic alienation from the union at the chapter level must be ingredients in the explanation. While public education is facing an historic crisis, our union has thus far failed to involve the majority of members in a struggle to defend our rights and to improve our schools. Is our union any different from other unions? Probably not, except that our union allows retirees to vote and when you look at the new contract you can see that retirees are the winners. An article, which I only partially agree with, identifies the lack of active member participation in elections and we teachers are no exception to this. Presently, the two other caucuses, MORE and New Action, has failed to garner significant support and as for the E4E cult? They are simply a fringe group and a front for anti-union corporate reformers, who didn't even bother to enter the elections for fear of exposing their lack of membership. For our union to become more democratic, we need to have a new caucus that focuses on teacher justice and not social justice issues that dilutes the message and alienates a significant sector of the rank and file. Its time that a new UFT caucus be formed from the disenfranchised membership, ATRs, untenured teachers, and mainstream educators who are unhappy with the union's leadership and lack of support. Maybe the ICEUFT section of MORE can split and form its own caucus, as it did once before, and focus only on educator issues. Become a real trade unionist alternative caucus. Only then will the UFT leadership take notice and maybe our union will become more democratic and transparent. Until things change, its more of the same, a disconnected union leadership that cares more about their relationship with the City and DOE than for the membership. Yet Another Flushing High School Principal Leaves The Troubled School. The once prestigious Flushing high school has continued to academically deteriorate in the last few years and has become a dumping ground for "high needs" students throughout the borough. As a teacher there in 2011-12 I can personally attest to the problems at the school. The school was once slated to close but survived when the courts ruled against Mayor Bloomberg. Instead, like many of the schools that survived the axe, the Department of Education decided on a slow strangulation policy instead. Flushing high school now shares its building with two new small schools and have reduced freshman and sophomore classes. The result has been a major excessing of teachers in the last two years. Last year the average department excessed an astonishing four teachers from the school and over twenty teachers overall. During this time the school has had three diffwerent principals i n the last three years and a new Principal will take the helm this year making it four principals in four years. The latest casualty is the infamous James Brown. No not the singer but the Principal who was hired to lead troubled Flushing high school by then Chancellor Dennis Walcott, despite being found guilty in court by a jury of his peers for harassing a female subordinate who also accused him of sexual misconduct . Yes, he was found guilty and left the Baldwin school system and was hired by the Walcott Administration to be Principal of Flushing high school despite the Chancellor's long stated zero tolerance policy on alleged sexual misconduct. You can read the entire James Brown story on my blog Here. Moreover, during his troubled year as Principal he tried to artificially raise passing grades by putting in a grading system that was in violation of State regulations only to be exposed and subject to ridicule, before being forced to abandon it. It was only a little over two years ago when another questionable Principal was removed due to the police finding drugs in his car during a traffic stop. He now works at the DOE in another capacity. His story can be found Here. In between Mr Brown and Mr. Hudson the DOE hand-picked Principal alienated so many of her staff, that she fled the DOE entirely and know works in a school district upstate after only one year at the helm. How can a school be successful when the very leaders the DOE selects for the school have serious character issues, lack extensive classroom experience, and are selected on who they know and not on their academic credentials. Until the DOE puts the very best in roles of leadership, no school will be able to show real academic improvement and Flushing high school is a prime example of the academic neglect by the DOE as they have failed to put a real educator, with high academic standards as a role model for staff and students alike. 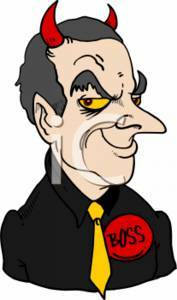 Many teachers who are targeted by their Principal for incompetence and misconduct complain that instead of collaborating with them to resolve their personal differences and offering support to improve their pedology, the principal pre-planned the attack on these teachers. The problem is proving it and that is the crux of the issue. However, in the South Bronx School blog we get an insight of how a Principal planned to target this blogger for incompetence, despite the teacher never getting an "unsatisfactory rating" previously and was "S rated" in June of that year. If it wasn't for the "due process rights" that gives us our tenure protection, he would have been terminated simply because the Principal didn't like him. If you have been following the South Bronx School blog, you know he was charged and awaiting his hearing under section 3020-a for incompetence and misconduct by his Leadership Academy Principal Dr. Alison Coviello of PS 154. I previously wrote a post about Principal. Coviello's reign of terror and you can find it Here. Well, it appears that South Bronx School was somehow able to obtain an email from Ms. Coviello that was sent to her Assistant Principal on the strategy they were to use the following school year to make sure they can charge the teacher with incompetence. The August 24, 2012 email was printed by South Bronx School in the August 7th 2014 post and is reprinted here. According to the South Bronx School blog this is the "smoking gun" that shows that the Principal decided beforehand to go after the teacher. It certainly appears that the Principal was targeting the teacher even before the school year started and that brings into question the validity of the charges against the targeted teacher. In other words, the Principal already assumed a predetermined outcome and prepared a strategy to implement it. From my point of view, the Principal's harassment of the teacher in the 2012-13 school year was pre-planned and morally wrong and hopefully, the arbitrator will see that instead of working with the teacher to resolve their differences and do what's best for the students of the school, Dr. Alison Coviello , instead did the exact opposite and harassed the teacher and in turn hurt the students of her school. If it wasn't for our tenure protection, he and many other teachers would be terminated simply upon the whim of a Principal, many of them unqualified themselves. How Come Our Increase Of Union Dues Are Not Deferred Until 2020? I received my September 15th paycheck and noticed our union has increased our dues by almost 5%. At the same time, my salary will only go up a meagerly 2% come September 30th. I think its only fair if our union followed the same procedures they accepted for the rank and file. Therefore, the union should rollback the dues and allow it to rise in lockstep with our deferred raises. That means our dues should be reduced back to 2009 and the increases should reflect the raises their members actually get that were negotiated by the union. I guess the union can't rollback our dues since they need it to replenish the money that they blew by co-sponsoring an anti-police march and making nice with Al Sharpton. Maybe our disconnected union leadership will next co-sponser a meeting with the education reformers by claiming they are simply misunderstood and only wants to do what's right for the students. Oh wait, they did invite Bill Gates to be a keynote speaker at the Seattle AFT conference. What's next for our President, Michael Mulgrew, after screwing the ATRs and giving members an inadequate contract, holding hands with Al Sharpton, hugging Chancellor Carmen Farina, and threatening to punch you in the face if your against his beloved Common Core? I shutter to think what's next as our disconnected union leadership does what's best for them and not for the members. 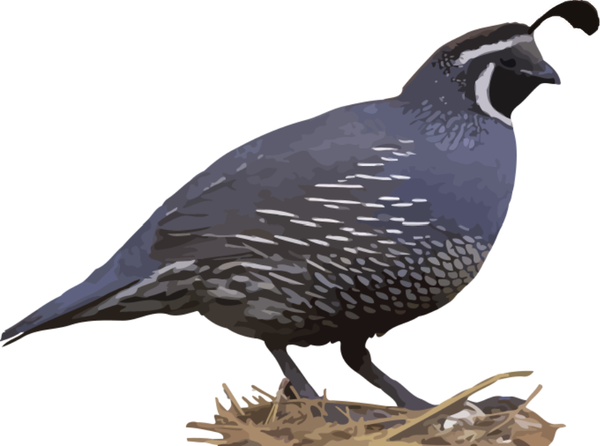 Quail anyone? The tab is on the members. The DOE Weekly Rotation Is A Waste Of Time, Money, And Talent. 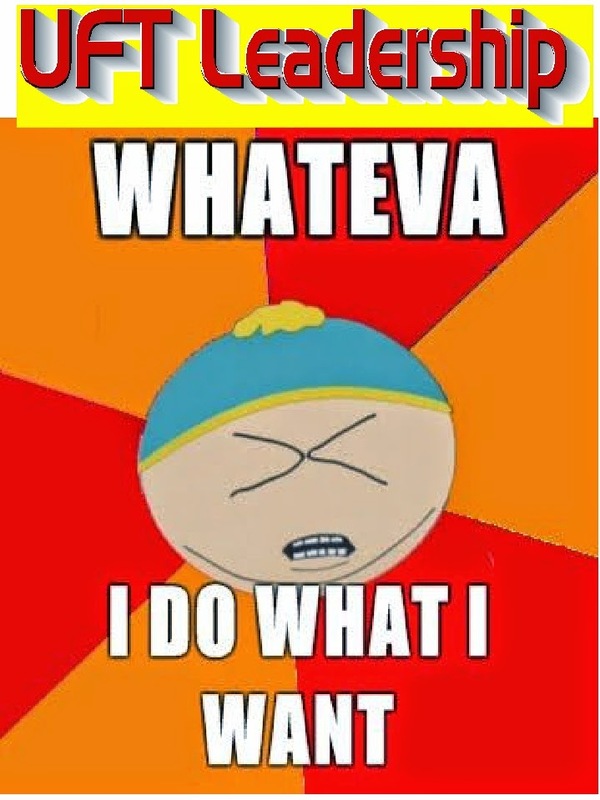 Once again I find myself starting the school year in a school that doesn't even have classes in my subject area. However, this year the DOE is not even pretending to try to match ATRs with vacancies. Instead, the DOE will make a more determined effort to terminate ATRs, thanks to the new contract provisions negotiated with the disconnected UFT leadership. True, the DOE claims that starting September 15th, the DOE will start interviewing ATRs for any vacancies that will become available after October 15th. The exceptions will be any ATR that survived their discipline hearings but received a $2,000 fine or more or received at least a 30 day suspension. This includes any ATR who took a stipulation in lieu of going through a 3020-a hearing. These ATRs are about 25% of the pool and are known as the "untouchables". Its highly likely that any ATR who receive an unsatisfactory observation last year will also not be offered a vacancy since the DOE would rather go for two consecutive "U ratings" and start 3020-a termination proceeding then to allow the ATR to go through with the Danelson program since the ATR would need to get two consecutive annual "ineffective ratings" before the DOE could terminate the ATR. This week the UFT will be giving their annual ATR "dog and pony show" and spin it in such a way as to make some of the more naive ATRs hope that the union will have their back and will make great efforts to drain the ATR pool by aggressively making sure that all school vacancies will be covered by the ATRs. They will also claim that principals will not have to pay for the ATRs for two years. However, they will not tell you that in the third year the ATR salary will become part of the school payroll and few, if any, principals will want to take a chance of seeing their budget reduced by being forced to pick up the ATR's salary. The UFT meetings can be found on the ICEUFT blog. The Education On The Cheap Era Continues Under The Disappointing Chancellor. When Bill de Blasio replaced Michael Bloomberg as Mayor of New York City, many of us were looking forward to a new era of collaboration and respect. The new Mayor's selection of a long-term educator as Chancellor was also an encouraging sign as it signifies a change away from the failed business model which was the hallmark of the Bloomberg era. While the new Chancellor, Carmen Farina, has had a troubling past, she seemed like a breath of fresh air when compared to the top-down non-educators who were chancellors during the Bloomberg era. Even the UFT leadership hailed the new Chancellor as a person they can work with and UFT President, Michael Mulgrew, even hugged her. 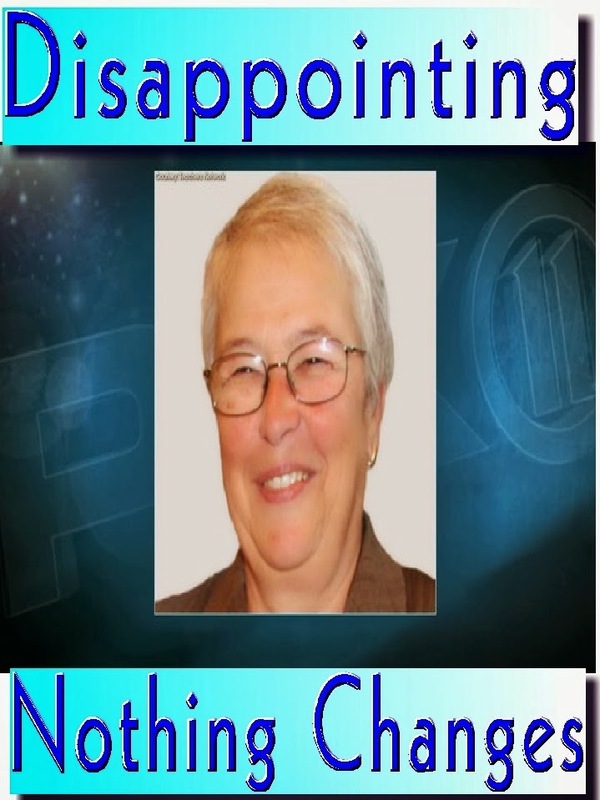 Unfortunately, in the first semester plus of Carmen Farina's tenure as Chancellor she has been a disappointment. The Chancellor, has so far, failed to make any meaningful improvements in the schools and the classroom. First, she froze the already tight school budgets that has averaged 14% less than it was back in 2008. Second, she did not reduce class sizes, a campaign promise by the Mayor, third, she did not "clean house" and retained many of the architects of the destructive Bloomberg policies. Fourth, she retained the "fair student funding" that forces principals to hire the "cheapest" and not the "best teachers" for their schools. Fifth, she failed to get rid of the money sucking and useless Children First networks. Finally, the new Chancellor has targeted ATRs and made them "second class citizens". In hindsight, Chancellor Carmen Farina does have a "dark side" that people seemed to ignore. Like the 80% turnover in staff when she was Principal, her rise to become a Deputy Chancellor under Joel Klein before being forced to retire, and this from Philip Nobile. In addition, Betsy Combier in her Rubber Room Reporter blog is a must read when going over the Chancellor's past. She has continues to suffer from verbal lapses such as her "its a beautiful day comment" during a monster snowstorm that trapped students in their schools. Moreover, her verbal attack on ATRs and her statement that she will train principals how to terminate them rather than encourage principals to hire them for their vacancies is not only unprofessional but continues the demonetization of the ATRs that started in the Bloomberg era. Most disturbing of all she told new teachers at a conference not to listen to those disgruntled veteran teachers in the lunch room. With Carmen Farina as Chancellor do not expect any real academic improvement or a narrowing of the racial/income academic achievement gap as she continues the failed and destructive policies of the Bloomberg era. A very disappointing Chancellor is Carmen Farina as she continues to practice the "education on the cheap" policy of the Bloomberg era. The DOE Double Standard Continues. During the Bloomberg era the DOE repeatedly failed to discipline administrators and when they reluctantly did, they gave them a mere "slap on the wrist" for actions that would have led to termination if it was a staff member. With a change in the Mayor's Office and a more "progressive" and friendlier person at the helm, we all hoped his new Chancellor would "clean house" and change the tone at the DOE from a "gotcha mentality" to a more collaborative agency. Even the UFT President, Michael Mulgrew, claimed he saw a new tone at Tweed and even hugged the new Chancellor. However, nothing has changed, its still the same old DOE as the new Chancellor failed to "clean house" and retained many of the high and mid level architects of the destructive Bloomberg years. Sure, there has been some changes at the top but most of them left because they were frustrated with the lack of focus and leadership from the Chancellor not because she wanted them out. Unfortunately, many of the people who remained are the implementers of the hostile Bloomberg policy and it shows in the just completed contract with the UFT that makes ATRs "second class citizens" and makes ATRs who won there discipline hearings an "untouchable". 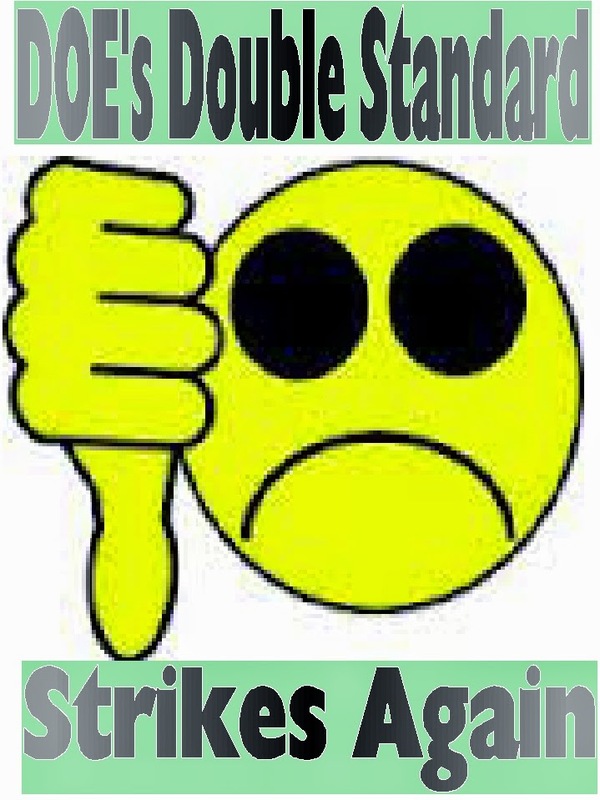 One of the policies that appears to have not changed is the DOE "double standard" when disciplining administrators and staff members. In many cases, administrators are either not disciplined or given a mere "slap on the wrist" for actions that would have led to the DOE to file 3020-a termination charges against a staff member. The latest examples of this "double standard" is the Assistant Principal who changed 11 grades from failing to passing for his son at "Bread and Roses" High School. His punishment? He is now an ATR Assistant Principal, no 3020-a charges. Another recent case is the Assistant Principal at Automotive High School who dismissed two teachers from scoring because they were too strict on his seniors who he was trying to graduate out of the school.and apparently, in violation of the intent of the City's and maybe State regulations re-scored them His punishment? None. Finally there's the case of the Principal of Murry Bergtraum High School who abused the credit recovery program that pushed seniors out of the school without them appearing in class to get the undeserved credits to graduate. Rather than go for termination charges, the DOE made her a Principal at another school two years later. All three cases can be found Here, Here, and Here. Moreover, what happen to these two leadership academy principals in the Bronx who proved to be poor role models and parents demanded their removal? They still are principals in their schools! Here. and Here. If it was a teacher the DOE would have not only removed the teacher from the school but would most certainly have filed 3020-a termination charges. I guess nothing changes when it comes to the DOE "double standard". Chancellor Carmen Farina Declares War On Teachers. On Sunday, the New York Daily News interviewed Chancellor Carmen Farina and asked her what her goals were for the 2014-15 school year. Not unexpectedly they were the Mayor's pre-k program, higher passing rates on State tests, and more parental involvement. However, when it came to teachers, the Chancellor showed her true colors, she told the Daily News that she will train principals how to terminate teachers they don't want rather than collaborate and support hem. Notice, she didn't say "ineffective teachers" but teachers who principals don't want. The Chancellor also went after the ATRs by claiming that there will be a dramatic reduction of teachers without a classroom by mid October. Did she mean that the ATRs will be offered vacancies? No, according to the Chancellor, the reduction will be due to the conditions of the new contract that has already resulted in 97 teachers taking the buyout (almost all of them were retiring anyway) and by actively going after ATRs for dubious disciplinary issues. Interestingly, the Chancellor is full of contradictions as well as she, on one hand, wants principals to properly document teacher actions that can lead to termination while , on the other hand, wants to improve teacher morale. Let's see if you redouble the efforts to target teachers that will improve their morale, what an idiot! I guess the Chancellor believes in the statement "that the beatings will continue until morale improves". Moreover, she claims she wants to improve teacher retention. How can she do that when she refuses to remove vindictive and incompetent administrators that result in high teacher turnover in their schools? Furthermore, class sizes, the largest in the Stace, are not being reduced. Finally, her failure to discontinue the "fair student funding" and freezing already tight school budgets forces principals to hire the "cheapest" and not the "best teachers" for the students basically assures for high teacher turnover going forward.. The Chancellor claims there will be no "forced placement" and that there is mutual consent. However, if a Principal requires that an ATR interview and offer a position, the ATR has no choice but to accept the interview and the position or the DOE will consider that the ATR has resigned. That, to me, is not mutual consent and is a forced placement. What is the union's position? They just close their collective eyes and the disconnected leadership will claim that you must take the position. According to UFT President, Michael Mulgrew, there is a new attitude at the DOE. Yeah, a new attitude as the DOE redouble their efforts to target the classroom teacher, lead by a very disappointing Chancellor..